« What is Energy Medicine? Many years ago, I was in the front row to hear Maya Angelou! Her words of wisdom were profound and her presentation was delightful, thought provoking and…. for me… quite moving. She said some things that the audience found humorous and other statements that were met with the silence of significant thought. Other bits of wisdom were met with quiet conversations and remarks spoken in whispers. One of her famous quotes came after she told a story. The story ended with her looking out into the audience and stating, “When people show you who they are, believe them the first time.” I remember thinking to myself…”Well, that’s not fair! People can change.” I am one of those people! I was an unhappy teenager. I was angry about a multitude of things and was quite sure my entire future was doomed to be filled with continued trauma and drama. But, I changed. I changed my attitude, my perspective and my outlook and everything improved! Because it happened for me, I believe everyone wants to be happy and everyone will look for a pathway to make it so. Right?? Doesn’t everyone desire to be happy? Isn’t everyone willing to make changes to achieve a greater level of happiness?? Over the years after the event, I looked over my notes often. I agreed with her on every level and every point, except that one statement. I always believed people can and want to improve their life and their outlook. I had a fundamental belief that no one truly wants to hurt or harm another. I believed it is our responsibility to and for others, to believe they can change and to support them as they do. It’s part of the reason I became a Health & Wellness Life Coach…. to assist those who are ready and willing and to provide the tools to make it easier and more efficient to find and keep a positive perspective. Recently, I’ve revisited this pearl of wisdom from Maya. I’ve had to make a few changes to my belief system. I recognize that everyone can improve and have a metamorphosis which leads them to create a life of wonder and happiness and joy. I also recognize, for many people, it’s easier to blame others, complain and stay right where they are! And finally, I’ve had to realize that there are those who will give lip service to all the “right” things and their actions tell quite the different story. Actions speak LOUDER than words ever will. When the actions are not in alignment with the verbiage – listen to the actions/behavior. What people do and how they do it is more expressive of their intention than their words. 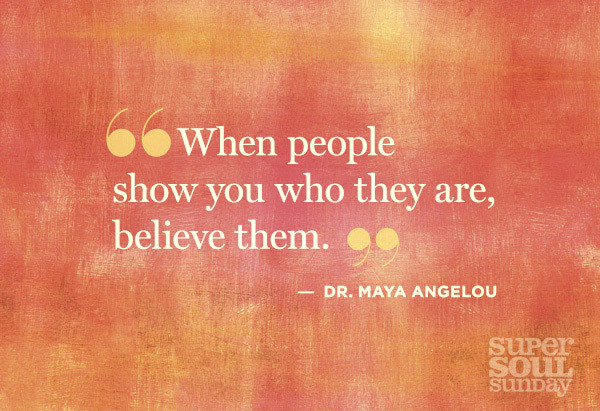 When people show you who they are, do you believe them the first time? Do you allow for the possibility they may change and become more focused on love and service to others rather than self-service. Or do you take your first impression of them and assign it to them permanently? Do you believe people can change and improve? I think we have to be mindful of what people show us and allow for it to improve. But don’t assume it will …. 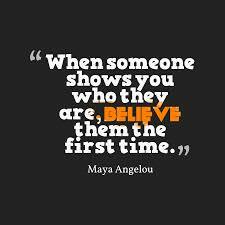 and don’t be disappointed when they show you who they really are! We all have free will and get to choose our attitude and behaviors. We can’t be disappointed if we have no expectation of another person’s way of being. Thus we cannot be disappointed when someone shows us who they really are….